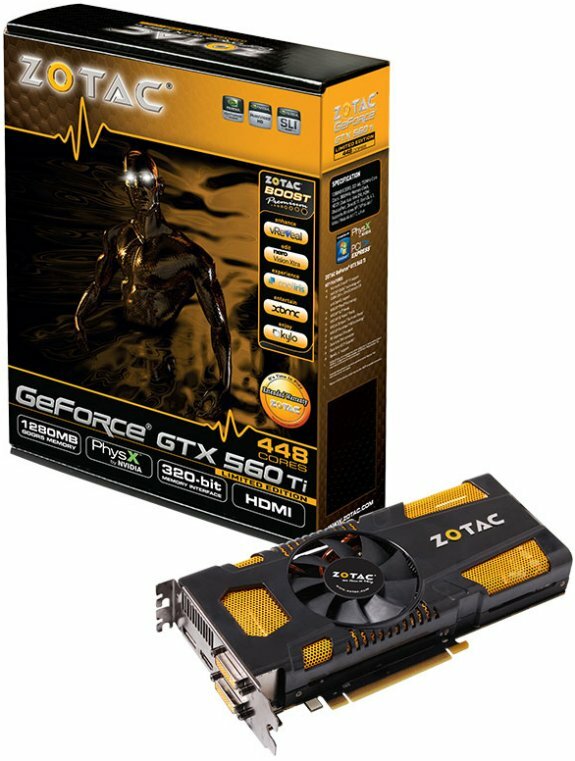 Zotac reveals its GeForce GTX 560 Ti 448 Cores. It has a 765MHz core, 1530MHz shaders and 1280MB GDDR5 memory clocked at 3800MHz. ZOTAC International, a leading innovator and a channel manufacturer, today unleashes the GeForce GTX 560 Ti 448 cores Limited Edition graphics card geared for the latest stunning Microsoft DirectX 11-enabled titles. The ZOTAC GeForce GTX 560 Ti 448 cores Limited Edition graphics card delivers the performance and visual details gamers crave for an unmatched immersive gaming experience. Equipped with 448 lightning-fast shaders and 1280MB of GDDR5 memory, the ZOTAC GeForce GTX 560 Ti 448 cores Limited Edition graphics card packs a performance punch. “PC gaming is a strong segment that continues to grow and now is the best time to upgrade for the latest DirectX 11 releases. With the ZOTAC GeForce GTX 560 Ti 448 cores Limited Edition, gamers can easily equip their PC to play the latest titles with ultra-quality settings up to 1080p – beyond what a console can deliver,” said Carsten Berger, marketing director, ZOTAC International. The ZOTAC GeForce GTX 560 Ti 448 cores Limited Edition is NVIDIA SLI ready with dual SLI connectors. Up to three ZOTAC GeForce GTX 560 Ti 448 cores Limited Editions can operate together for up to 2.8-times the performance of a single card or unlock 3D Vision Surround technology for triple-display gaming. It’s time to play with the ZOTAC GeForce GTX 560 Ti 448 cores Limited Edition.